On Tuesday night, on the eve of Tu B’Shevat, the Jewish New Year of the trees, over 150 people from across the community gathered at New North London Synagogue (NNLS) for the launch of Eco Synagogue, the ground breaking cross communal initiative to enable Synagogues to become more environmentally sustainable. Over 20 Synagogues from across all denominations were represented at the launch. Eco Synagogue, created with the support of the highly successful Eco Church, was founded by Finchley Progressive Synagogue, Finchley Reform Synagogue, New North London Synagogue, Muswell Hill Synagogue and Alyth Synagogue. Eco Synagogue has been endorsed by the Board of Deputies and operates through an online survey which assesses Synagogues’ activities – for example looking at how energy-efficient their buildings are and how they tend any land they own or care for; whether they consider the environmental impact of food served at events; the extent to which ecological principles are reinforced in teaching, preaching and other opportunities within the cycle of the Jewish year; and how members can be encouraged to become more environmentally responsible. To mark Tu B’Shevat, and to ensure environmental sustainability, fruit from a local organic greengrocer was served along with drinks in reusable cups. Early adopting Synagogues have applied for food waste recycling, reviewed their energy sources and switched to renewable energy providers, created green travel plans, become affiliates of energy schemes that raise funding to invest in green projects, and established a regular series of farmers markets to promote organic and sustainable produce. Rabbi Jeffrey Newman, Rabbi Emeritus of Finchley Reform Synagogue, introduced the Eco Synagogue project. 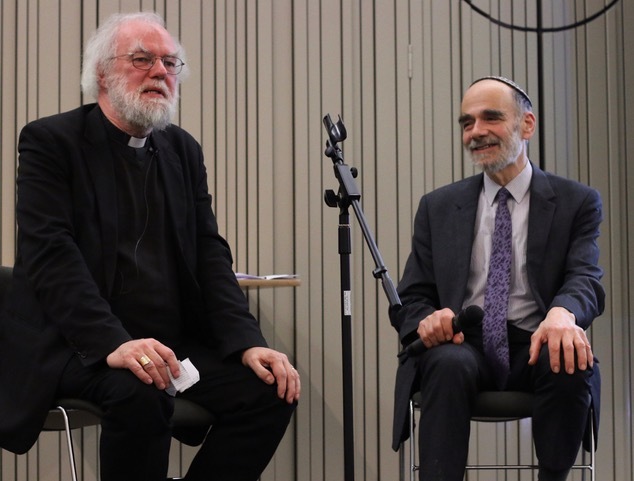 Rabbi Jonathan Wittenberg, Senior Rabbi of Masorti Judaism and Senior Rabbi of NNLS, had a rich and deep discussion with former Archbishop of Canterbury Dr Rowan Williams about the causes of and solutions to our growing environmental crisis. Dr Rowan Williams, who spoke at the launch of Eco Church in 2016, talked about the moral challenges of climate change and said: “the impact of climate change weighs most heavily on those who are least able to meet it” and that we must respect the land with the “world being a habitat for the human family”. Rabbi Jonathan Wittenberg was thrilled that the founding members of Eco Synagogue represented the breadth of the Jewish community and said: “The environment affects all of us. Sacrifice is needed and we as a community need to change our ways”. Rabbi Mark Goldsmith, Alyth, gave an overview of Eco Synagogue and said: “We are investing in community building and Eco Synagogue will provide a blueprint for Synagogues to meet their environmental responsibilities”. Eco Synagogue hopes to recruit 25 synagogues to participate in the first year and give out the first Gold Award.